Parenting is both the hardest and most wonderful thing you will ever attempt. Let this mother who homeschooled five sons (and lived to tell about it!) share her wisdom with you in this Biblically-based book. 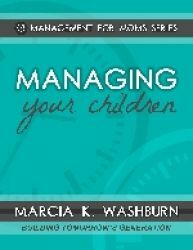 In this book Mrs. Washburn uses examples of gardening to show how we need to nurture our children. We as Christians need to have encouragement and help from those that are older and have been through this part of life. She uses scripture to help show how God wants us to bring up our families. Our children are as little flowers in the garden and as Mrs. Washburn will explain, we need to water, protect and groom them for the future so they can bloom brighter than any other flower in their midst. No, things won’t ever be perfect, but with the help of our Lord we are able to guide our little seedlings so they can grow and bloom. She also gives helps for traveling with our children and making life fun. All families need that time away to enjoy and regroup. She has made lists to help make these trips cheap and enjoyable and the packing to go as easily as possible.